“33” is not an easy episode to write about, because it fits together so well: It’s hard to pick up one piece and examine it, because the pieces make up a satisfying whole. Almost every moment in this episode is polished to high shine; each moment feels like its own unique gem. A lot of that power comes through the simple conceit of sleep deprivation—a very human concern in the midst of what is otherwise an alien landscape of spaceships and Cylons. Gaius Baltar says it himself as he’s hallucinating Six and his old house on Caprica: “There are limits to the human body, the human mind. There are tolerances you can’t push beyond.” Battlestar Galactica is concerned with human existence—with what it means to be human, and with how to be human, too. The crew members snap at each other, start giggling for no reason, make rambling, loopy hypotheses for why the Cylons come every 33 minutes instead of 34, or 35… (“Cally.” “What?” “Shut up.”). Starbuck is so strung out that she picks a fight with Lee for no reason, only to start laughing at her own self-seriousness. The fighter pilots are on “stims” and the command crew is trying not to fall asleep at their desks. The episode makes much of Boomer’s imperviousness to the sleep deprivation—she’s tired, but it’s not affecting her as badly as everyone else. Starbuck makes a joke: “It’s because she’s a frakking Cylon, that’s why!” Cue dramatic irony, of course: It’s the type of remark that makes you tense in your seat. But it also illustrates what makes people people—their incredibly predictable weaknesses. Sleep, here. The Cylons are machines: They can give chase for a lot longer. It’s a genius conceit for any episode, and a particularly apt one for this show. It might be hard for a modern television audience to understand nuclear holocaust or Cylon invasion, but sleep deprivation? We get that. We’ve been there, whether it’s been with a crying baby or a bout of insomnia or pulling an ill-advised all-nighter or the construction work that starts at 6 a.m. on Saturday morning, without fail. This first episode of the regular season of Battlestar Galactica manages to pull off a feat that other shows spend seasons trying to perfect: It tells a story on multiple levels all at the same time, allowing for the characters in their scenes to both be entirely real and also pawns of a higher power and also figures in an allegorical struggle between good and evil. Other shows go for all of these different levels of storytelling with some regularity, but not all manage to make them work at the same time. It’s the also-ness that really strikes me about Battlestar Galactica—an ability to be many different things at the same time, to exist in several different modes simultaneously. If the text of “33” is any indication, that’s a very deliberate choice. For most of the episode, two stories happen in parallel: The fleet’s sleep deprivation as they flee the Cylons, who show up every 33 minutes, and Six’s continued haunting of Gaius Baltar, as he keeps dropping into eerily lucid dreams. Then the Olympic carrier goes missing, and all of a sudden, those two stories—with their wildly divergent interpretations of what is really happening with the Olympic—collide and merge. But what’s truly remarkable is that it’s not two competing narratives. It could be, but they’re brought together so tightly that what “33” actually yields is two coexisting narratives, in which the truth is both that God moved the Olympic so it would not harm Gaius Baltar and that Commander Adama and Laura Roslin acted decisively in the aftermath of an accident to save the fleet. Battlestar Galactica is often called a “space opera,” sometimes a little derisively—it’s a soap opera, but in space! But whenever I think of the term, it makes me think of actual opera, in which the typical rules of popular entertainment are bent so far they double back in the other direction. Opera is about creating a mood and a feeling and a sense of the sublimely beautiful that makes the viewer feel something beyond their everyday mundane humanity. It does that by capitalizing on mystery and romance and soaring arias. And it often operates in a space that is beyond the confines of what we believe to be possible or probable. Realism and accuracy fall by the wayside, supplanted by the audience’s very willing suspension of disbelief. The miniseries offers up the idea that Battlestar Galactica has an operatic mode—it draws on the language and archetypes of epics to slingshot its cast of characters into deepest space as they flee for their lives. But “33” is singular for offering up the operatic side-by-side with the operational reality of the characters’ lives. The miniseries has the closed-endedness of cinema, where an ending is imposed on the story, for better or for worse. The television series has, if they’re lucky, a near-infinite amount of space. And as any soap opera fan would tell you—it is hard to attempt to attain the sublime when a narrative has no end. The second act goes on without ending, and it takes a lot of energy from the audience to consistently care about the characters. It speaks to Battlestar Galactica’s skill that most of the time, especially early on, investing in the multiple levels of the story seems effortless—even vital: Just one more episode, guys, c’mon. Six and Gaius Baltar’s relationship is central to my understanding of Battlestar’s multi-level storytelling: They know that what they’re seeing unfold is a story, and just as we are looking at them and trying to make the pieces fit, they’re looking at their own lives and the rest of the fleet with some detachment. And while they look at their story, we the audience look at their story, too. 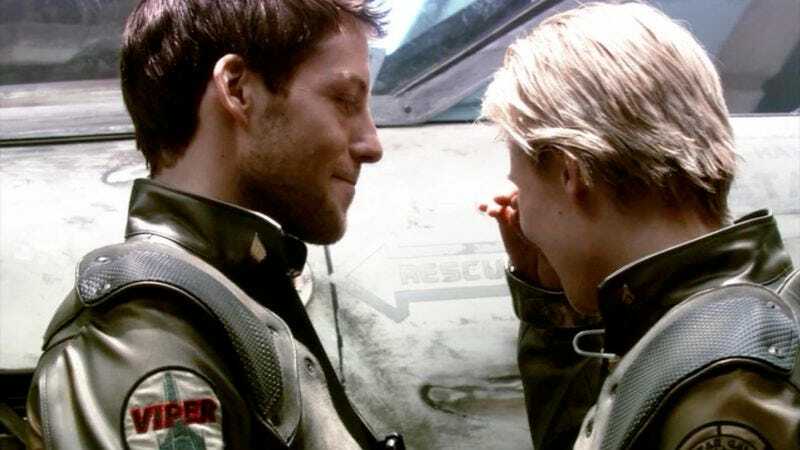 The characters are so good at interrogating the plot they’re embedded in that it’s sometimes easy to forget that Battlestar Galactica is a story offered up to us for our own interpretation. It really hit home for me in the two scenes on Cylon-occupied Caprica, when the other copy of Six who finds Helo asks him, “Are you alive?” I talked in my first review about how that’s a question that comes to the center of Battlestar Galactica’s central tensions, as Cylons try to discover whether or not they’re human, and humans question what it means to be alive. And of course in “33” Six is asking a desperate and radiation-sick Helo whether or not he’s survived the nuclear attack. But it also functions on a metatextual level: Karl Agathon thinks he’s alive. But he’s not! He’s a character on-screen, played by Tahmoh Penikett, and Battlestar Galactica is a show, and Caprica is in fact some verdant location in British Columbia. That one little question holds all of the ambiguities and complexities of this show—to take liberties with Euclidean geometry, it’s the point at which all the planes converge. The other point at which the planes converge is babies. (Babies! Babies everywhere!) Reproducing got a shoutout at the end of the miniseries, but it’s not until “33” that Six plays her own hand about children to Gaius Baltar—and it’s also not until “33,” six days after the Cylon invasion, that the fleet gets to add a number instead of subtracting hundreds: a baby boy is born, on the Rising Star. Commander Adama made the nod to babies in the miniseries when he saw Dee and Billy flirting with each other; Six brings the idea of a Cylon-human baby front and center. Those of us who have seen the series know why the copy of Eight on the ground finds Helo and spirits him away; we know too some of the Cylon plan for these mixed-race children. What’s interesting here is that the Cylon plan, in its early stages, is posed as divine directive: “Procreation is one of God’s commandments.” Whereas from the humans, it’s been couched as a form of survival: The race needs more people in order to have a fighting chance at immortality. Unsaid in both of these, but inherent in both, is that third reason for choosing to have a child: loving someone, and having faith that the world the child is born into will be one worth living in. To expand not just a plan or a species but a family, on a very small scale. Which may be why so much of the power of the episode is also derived from moments that reinforce human intimacy: whether that’s Gaius and Six using the destruction of humankind as foreplay or Dee standing in the hallway with the photo memorials, looking lost and defeated. 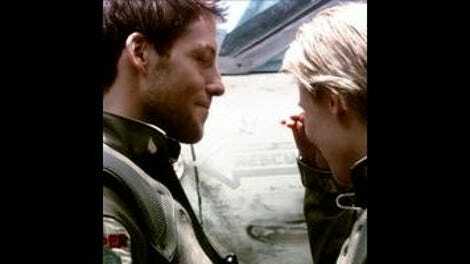 Apollo and Starbuck suddenly cracking up with laughter in the middle of a tense scene. Tigh confessing to Adama that he hasn’t felt this alive in years. The pilots, as they come out of their briefing, all tapping the photo of a fallen companion in their own unique way. (Someone draws a little circle; someone pats with their whole hand; someone says “Never forget.”) The universe is very grand, and we are very small in it. But it all matters, simultaneously, all at once. Sorry this review was late! That scene with Apollo and Starbuck yelling at each other and then laughing is so perfect for the both of them that it makes my heart hurt. It is fitting that Dee is the one that makes the serendipitous mistake, after that scene where she’s looking for survivors from Sagittaron. It’s one of the few scenes where a character is presented isolated from everyone else around them, and even as the episode continues she’s sort of shunted off to one side, suffering very, very quietly. Her little slip-up when she gives Adama the wrong form to sign is also handled so gracefully. That type of thing is easily grating; Kandyse McClure makes it as heartfelt as it should be. By the way, Gaeta defending Dee is also pretty damn adorable. Not romantic, I think: Just a friend and superior officer sticking up for someone in his charge. Office of the XO: Hey, now that we have multiple copies, keeping the names straight is going to be hard. So here’s what I’m doing for now: “Boomer” is the copy of Eight on the Galactica; I’m calling the copy on the ground with Helo “Sharon,” which is currently what he calls her. Also, because this weekend is Labor Day weekend, I might take next Thursday off so I can give the following two episodes their due diligence. What’s On Tonight will have the details. On the plus side: Enjoy your weekend. Everyone take your stims; XO’s orders. And now it’s your turn: Oh, let’s ’ship, friends. What’s your BSG ’ship? Mine: Apollo/Starbuck, forever.